This is a wonderful excursion where you will discover the most spectacular valleys of the Atlas Mountain region. 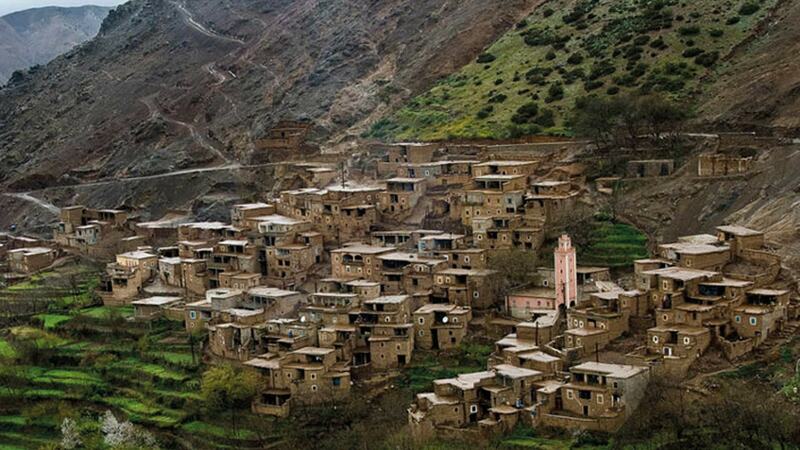 Ourika Valley, Sidi Fares and Imlil valleys. Your day will begin at 9am. We pick you up from your Riad or Hotel in Marrakech towards Ourika. On the way to Imlil, we will go through the Haouz plain, arid region that the Berber population has managed to highlight. and enjoy the scent of olive orchards, apricot trees and also beautiful cereal crops. Explore the surrounding area. If the day of the tour coincides with a local Berber market (Souk) day in one of the villages, we stope in the morning to show you around. We also encourage our guests to bring with them unwanted change of clothes or shoes, and school supplies etc, that you can distribute yourself once there because we cross many Berber villages and we meet so many children on the way. In the middle of the day, we expect a real Berber traditional meal to taste directly with the locals. A simply unforgettable experience! in the genuine Sidi Fares valley famous for its apple trees, the food will be organic and homemade: tomato, salad, chicken tagine, couscous and seasonal fruit. If you are vegetarian, Please let us know 24 hours in advance. After this eventful meal, we invite you to leave for the roads of the valley of Asni or Imlil stunning valleys succeed. There are small villages where the joy of living is the key word. Wheat fields and poppies dominate the area to bring us landscapes as varied as each other. You can also admire Mount Toubkal the highest peak in North Africa at 4167 meters peak. By late afternoon, return to Marrakech and we will bring you to the place of your choice.